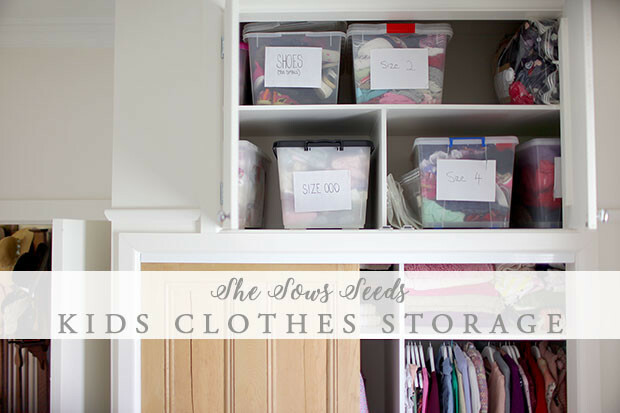 I’d like the share some more everyday home-life type things here on She Sows Seeds, which at first I thought “Good grief, who on EARTH wants to hear about how I organise my pantry or make my own washing powder or make my bed?” Well, turns out – you do! Blogging to me is sharing and connecting and creating a community. This is the stuff that women have been doing for thousands of years around fires and rivers and village squares, washing and cooking and having a whinge about husbands and shaking off ratbag kids. It’s all the same. And we are all terrible sticky beaks. We just are, don’t deny it. The voyeurism of all this blogging and social media, labelled ‘sharing’ and ‘connecting’ – it’s the same thing as the gossip around the water cooler of the 90’s. This is just how we do it now. 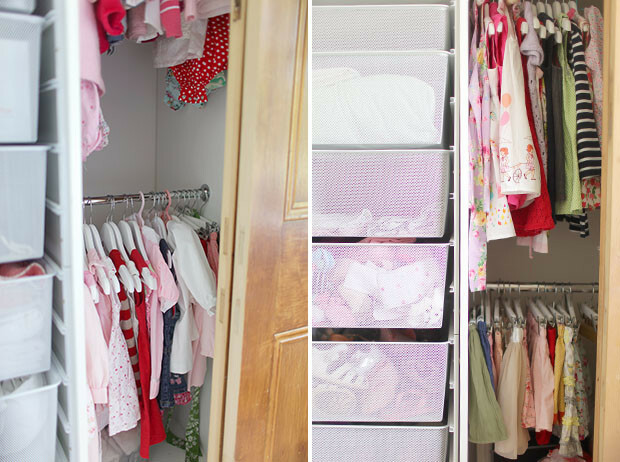 So, I know you’re just dying to see inside my kids wardrobes , right? Right. 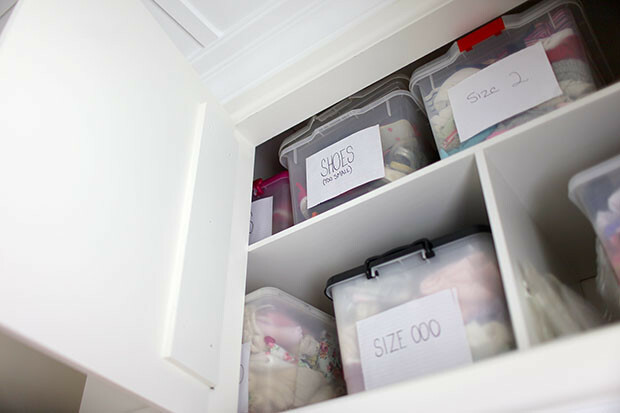 I’ve had a few people ask about the organisation of the girls new built-in wardrobes, how I have them laid out, what goes where and which clothes are hung and which are folded in drawers. Both Eleanor and Harriet have a fair bit of hanging space, as they have a collection of dresses, skirts, nicer tops/shirts that get hung up as well as the array of handknitted gems from my super knitter mum. Eleanor’s clothes obviously take up a lot more space than Harriet’s (and she has a lot more clothes, babies grow too quickly to have too much in any one size!) So in Harriet’s wardrobe her longer length hanging space is currently used for things like Matt’s suits that rarely get worn. As Harriet grows into size 1-2 dresses like Eleanor I think we will use that space more for her clothes though (move over Daddy!) 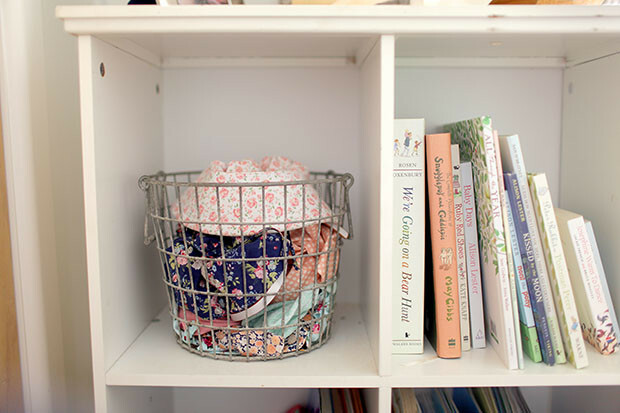 Harriet’s wire baskets in her wardrobe aren’t used for her clothes either – they are full of baby ‘stuff’. Sleeping bags, swaddles, cloth nappies, cot sheets, baby towels, breastpads, bottles, baby carriers. All of that stuff. This is also mainly because her clothes are still small and fit nicely into her chest of drawers in her room. 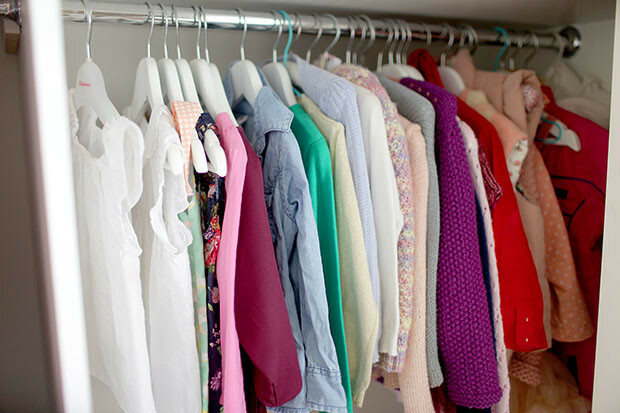 Each girl has a chest of drawers as well as their wardrobes. 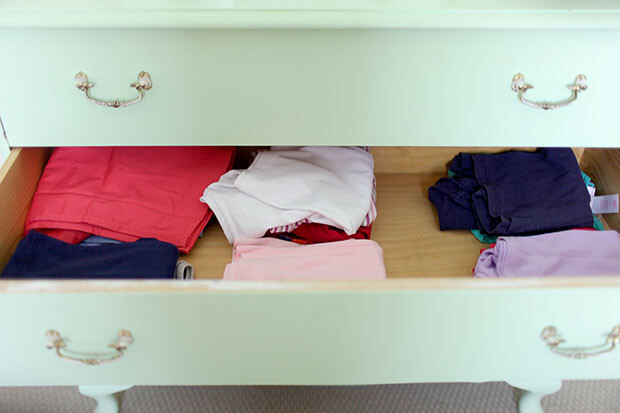 I have the drawers as follows: singlets and pyjamas in top drawer, tops in second drawer, pants in third drawer, jumpers in fourth drawer. Same in each room – easy for Daddy/anyone else getting them dressed (which is a rarity!) In Eleanor’s wire baskets in her room she also has socks and tights in one drawer, bathers in another, tshirts in another (they don’t fit in her chest of drawers, just long sleeved tops in there) and a drawer of shoes/slippers. I was in two minds when designing the layout for the wardrobes, whether to have the drawers accessible for toddlers or not, but I’m happy to have the drawers which Eleanor needs to access at Eleanor height, to hopefully encourage her to put away her clothes (maybe?!) and dress herself. That’s the plan anyway. But what about all of the clothes that the girls currently aren’t wearing? The too-big and the too-small? Also known as the tsunami of handmedown’s from my sisters’ three girls. Yup. We are lucky enough to have loads of big girl cousins, so literally 80% of everything Eleanor has ever worn has come from my sister. Beyond lucky, yes. Overwhelming at times, absolutely. The sheer volume of clothes has been epic! Each bag and box that arrives after Violet has outgrown I sort through, folding and putting away both physically and mentally, remembering each piece so I know what gaps need filling. Most of the handmedown’s are great quality brands, as they are what has lasted through the other older children to eventually find their way to Eleanor and Harriet! I’ve also learnt to be quite ruthless as I sort and fold and put away – if I wouldn’t dress Eleanor in it, it goes to the opshop. She has far too many clothes as it is, I don’t need more that won’t get worn. 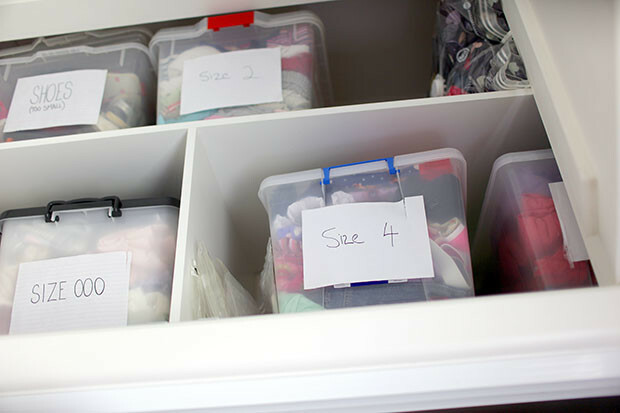 Once the clothes are sorted into sizes, they now live in plastic tubs up the very top of Eleanor’s wardrobe. We are lucky to have this space with our high ceilings, a feature we wanted to utilise in our new wardrobes was the vertical space available to us. We used to store all of the extra clothes in a chest of drawers out in the store room, as well as various vacuum sealed bags shoved under beds or wherever they could fit in our shoebox old farmhouse! Now with built-in wardrobes in all of the bedrooms we can have them inside, and organised, and labelled and making my obsessively neat husband very happy indeed! We still have a size or two in vacuum sealed bags, only because we couldn’t fit another tub up there. We also have a tub of ‘too small’ shoes and ‘too big’ shoes that gets pulled down regularly for a re-arrange for Eleanor’s growing feet. At the moment I have the size 00 bag down in Harriet’s nursery and am throwing the last of that size in there as Harriet wears them for the last time. There is also a stack of size 2 clothes on the bed in Harriet’s nursery to be put away from Eleanor as she is most definitely a size 3 now. Last but by no means least: accessories! I have a little basket that sits on Eleanor’s bookshelves which houses her hats and what-not. I rotate this from Summer to Winter, at the moment it has sunhats, belts and fabric headwrap style headbands in it. Coming into the colder months it will have beanies and scarves and mittens in there. Her hair clips and ties live in a wooden box on top of her chest of drawers. And that’s how it’s done! To say that having built-in wardrobes has been life changing for us wouldn’t be an overstatement. Before there were bags and boxes of clothes everywhere and spilling out of every corner of our already cramped living quarters – eeeek! No pantry, no linen press, no wardrobes, will do that. Now the kids clothes situation is under control we’ve given a big sigh of relief, it was overwhelming before and now it’s ordered and simple. The key is having a place for everything, and everything in it’s place – a system! Smuggling Peppa Pig tshirts to the op shop too?! And we still have it. Her good clothes are called town clothes ?